Welcome to the very first Virtual Potluck. What is VP? It's a concept that a group of us food bloggers developed; where we'll occasionally work together to post about a specific theme. Generating a true potluck of posts on said topic. We'll be talking about it on Facebook, Twitter and each of our blogs. There's a total of 12 of us and we've all got different tastes, focuses and talents. We hope to provide you with interesting content about cool products, recipes, and all things food related. I suggest you visit all of the blogs during these events...as each one of us will be bringing different things to the table. So let's get this potluck started. Our first VP is sponsored by Abrams publishing and being hosted by Donna at Cookistry. There are 8 of us participating in this event. What does this mean for you? 8 reviews, about 8 different cookbooks, possibly 8 new recipes and most importantly 8 chances to win. That's right each of us will be giving away a copy of the cookbook we review; so be sure to check Donna's blog for links to all the other reviews. If I had to pick one thing to specialize in it would be desserts...Italian desserts to be more precise. So it's only natural that I chose to review Dolce: Italy's Sweets by Francine Segan. This beautiful cookbook is filled with both classic and contemporary desserts for all skill levels. With a gift for making each recipe come to life, Segan shares cherished stories from Italian grandmothers, young and hip foodies, famous pastry chefs, bakery owners and food writers. Recipes include favorites such as cannoli, and biscotti to the more specialty items like Sicilian watermelon pudding and a Tuscan sweet spinach pie. With so many fabulous recipes in one book I had a hard time deciding which to try first. I decided on the Ricotta Pear Cake. Although, very time consuming and labor intensive this is probably my new favorite dessert. Two moist layers of hazelnut cake surround a fluffy ricotta and pear custard that keeps beautifully in the refrigerator for up to five days...but trust me it won't last that long. Preheat the oven to 350. Butter and lightly flour two 9 1/2 inch springform pans. Grind the hazelnuts and flour in a mini food processor until very fine. In a large bowl using an electric mixer with the whisk attachment, combine the eggs and sugar and beat on high speed for 15 minutes, until the mixture has quadrupled in volume. Gently fold in the hazelnuts and flour with a spatula until just combined. then add in the butter. Divide the batter between the two prepared pans and bake for 10 to 12 minutes, until firm to the touch. Set aside. In a small saucepan combine the pears, sugar, lemon juice, and cornstarch and simmer over medium low heat until the pears are soft. Remove from the heat, stir in the brandy, and let cool to room temperature. Set aside. In a small saucepan combine the sugar and 1/2 cup water and bring to a boil. Stir in brandy. In a large bowl, using an electric mixer, beat the ricotta, sugar and vanilla for at least 5 minutes, until creamy. Meanwhile, beat the cream until firm peaks form. Using a spatula, gently fold the whipped cream into the ricotta mixture. Fold in the cooled pear mixture. Remove one of the cake layers from the pan and place on a serving platter large enough to hold the outer ring of the springform pan. Brush the cake with 1/2 of the syrup to moisten it. Pile the filling in the center of the cake and put the springform ring back over the cake. Gently spread the filling to the edges and then top with second layer of cake. Brush the remaining syrup over the top. Cover with plastic wrap and put in the freezer until set, about 2 hours. Remove the springform ring and refrigerate until ready to serve. 1.Leave a comment on this page telling me your favorite Italian dessert. 2. Head over to Cookistry check out all of the other posts; leave a comment on one of them and come back here to let me know. 3. Tweet about this giveaway leaving a comment here letting me know. Use #virtualpotluck in your tweet. Contest ends Friday November 18th at midnight EST. Winner will be picked by random generator and announced shortly after. It looks fantastic. I don't know a lot about Italian desserts but this one you've featured looks divine. I love cake and I love pears. I love anything with ricotta in it and my stomach is growling for a taste! Looks wonderfully delicious!See you at #virtualpotluck! This looks so delicious, I bet that syrup takes it over the top--yum! Thanks for sharing Secret Restaurant Recipes . This sounds amazing! This is definitely on my to-do list. I commented on Farmgirl Gourmet's post. I have never had an.Italian dessert but would love to. I follow you on twitter and FB. My favorite Italian dessert is Tiramisu. I found your post through Cookistry. It would be nice if you left us a sample tweet to copy and paste if/when you do another giveaway with Virtual Potluck. There are so many nice websites and new cookbooks to remember! But I really appreciate the opportunity to win such a nice cookbook, so thank you for the opportunity. I am now following you on Twitter. I'm @BoonieSooze. I guess I'll have to go with gelato because I don't think I have had any other Italian desserts. I have posted on Miss in the Kitchens Penne with Mushroom Sauce and on the Sticky Cinnamon Scrolls. Don't know how to post on here but Anonymously. All the recipes in this VP look so yummy! I commented on Nelly's post on Cooking with Books! My favorite Italian dessert is canolli. YUM! I commented on Farmgirl's post about sticky cinnamon swirls. Now following on facebook and twitter. Mmmm sugary pears and ricotta... man that sounds amazing. Looks delicious too! That is one gorgeous dessert! I love the idea of hazelnuts and pears. Love hazelnuts in general. This was a great choice for the potluck. I understand it freezes well, which would be great for shipping! 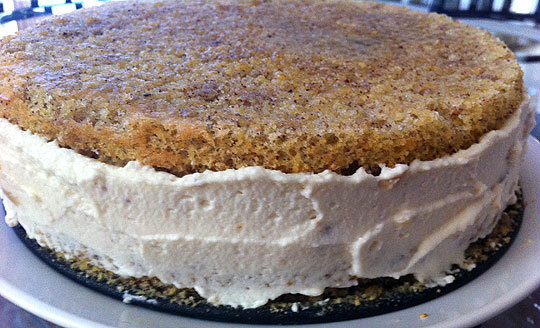 My favorite Italian dessert is an almond cake that a cousin in Italy made while I was visiting her; it had a zabaglione in it, I believe;it was incredibly moist. I posted on Farmgirl Gourmet. Your recipe made me decide to look for 00 flour; where do you get it in the Philadelphia area? I now follow you on twitter: ljskop. That's looks fantastic. Pears & ricotta=good flavor profile. Yummy. I may try this with the almond meal I have in my freezer. My favorite Italian dessert would probably be panna cotta with strawberry coulis. tiramisu is definitely my favorite italian dessert! following you on twitter, now. and i commented on farm girl gourmet right before heading over here! i'm looking forward to following the virtual potluck! That pear custard sounds amazing! I'll have to look for that cookbook. Funny how we never think of Italian desserts. It's almost impossible a task you ask! Choose between Tiramisu, Cannoli, Chocolate Gelato, Biscotti, Sacher Torte, Oh my...how can I ever? : D okay okay, hmmm...I choose, Cannoncini alla Crema Pasticcera-The Great Cream Horn, boy that was tough! YUM! I am always looking for new recipes for our Church's "In-Crowd" as they really really love their sweets! I can't wait to make this for them!!! Thank you! Hey, I did 1, 2 and 4. I sing like a bird; but I don't tweet or twitter. All the best. Still meeting the other participants and readings their blogs for the VP. Sent you a msg (no not mono sodium glutamate)lol Silly. And, I am just learning how the blog stuff works. All the Best. the A Cappellan. PS I am a huge fan (physically too)lol of Francine Segan. I have 3/6 six books. We have communicated via fb and email. I hope to get up to NY or bring her to Pittsburgh for a show sometime. cya. My favorite Italian dessert would have to be panna cotta. There are some really yummy flavors, and I like the smooth texture. What a beautiful dessert you made! 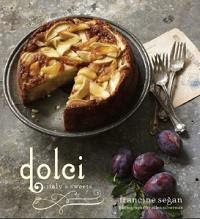 I'd LOVE a copy of Dolci! I just went to check out Cookistry and left a comment!